Trevor: You know what tonight is, right? Gloria: Oh no, what now? Trevor: I found you the perfect pair of bellbottoms. Gloria: And don’t tell me – an Afro wig. Gloria: (sighs) You’re killing me softly. Trevor: Gonna play that funky music. Trevor: Gonna walk on the wild side. Trevor: Fine. Go your own way. Gloria: (stares out the window) I will survive. Categories: fiction, Scecond Seat on the Right | Tags: 70s songs, dressing up, Flash Fiction, Gloria, Humor, humorous fiction, micro fiction, scene, short fiction, theme party, Trevor | Permalink. This is really what stream of consciousness writing is all about, isn’t it? Emptiness. Every time I’ve thought about writing this post today (and in the end I almost forgot to do it–imagine that), the only thing that has come to me has been the Taoist philosophy on emptiness being useful. A room with no space in it isn’t livable. Take things out of it–make space–and the emptiness makes the room useful. For a long time I’ve endeavored to, once in a while, empty my mind. The largely western idea of the purpose of meditation–to sit and think about something, or to meditate on something–is the opposite of the eastern philosophy. I meditate to empty my mind. To clear out all the thoughts and regrets and worries for the future–and stress. Because once my mind is empty, I can fill it up with new ideas, better solutions, and calmer thoughts. So how is writing stream of consciousness about emptiness? It’s a form of meditation. It’s the act of emptying our minds onto the page. 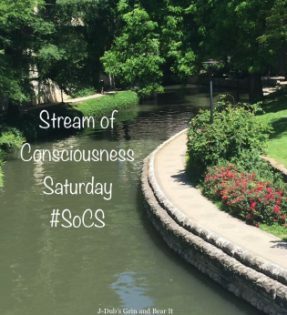 Categories: advice, Blogging, Blogs, Cool Stuff, Life, Opinion, Stream of Consciousness Saturday | Tags: deep thoughts, emptiness, inspiration, SoCS, space, Taoism, writing prompt | Permalink.